Sailing fans will be pleased to hear that the Government is entering a team into the iconic race as part of a bid to show off what the UK has to offer on a global stage. The slogan "Welcome to GREAT Britain & Northern Ireland" will be emblazoned across the boat in an effort to send out the message loud and clear that the UK is open for business. Sailing fans who also enjoy windsurfing and snorkelling while on holiday can arrange specialist watersports travel insurance. One of the world's best known sailing events. It takes place each year and sees teams of amateur sailors follow a 40,000 nautical mile course on board 70ft yachts. Each team is led by a qualified skipper on the 11-month circumnavigation of the globe. The race gets under way in August. The news comes in the wake of the British people's decision to vote for the UK to leave the European Union in a referendum last June. 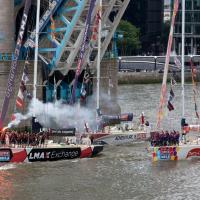 International Trade Minister Mark Garnier called the yacht race "a huge opportunity to showcase the best of British to the world". He made the comments while announcing Britain's intention to enter a yacht during an event at Portsmouth alongside Sir Robin Knox-Johnston, Clipper founder and chairman. Mr Garnier said: " Travelling along historic trading routes, the yacht will play an important role in promoting the UK as a place to visit, study and with which to do business."